Chromaticism is an important concept for any jazz guitarist to study and master in his playing. In this lesson, we’ll look at how you can take all of the scales and arpeggios you have learned over the years and turn them into “jazzy” sounding phrases by using chromatic approach notes. This is a big obstacle for a lot of people, but by working through the material in this lesson you will be able to hip up your lines. The notes that fall on the strong beats should be chord tones, the notes that fall between the strong beats should be scale tones or chromatic approach notes. Even the shallowest exploration of the previous statement will find it to be untrue in many circumstances, but it is a useful starting point to help learn one of the most important concepts in bebop. Example 1 is a good exercise that combines scales and chromatic notes. 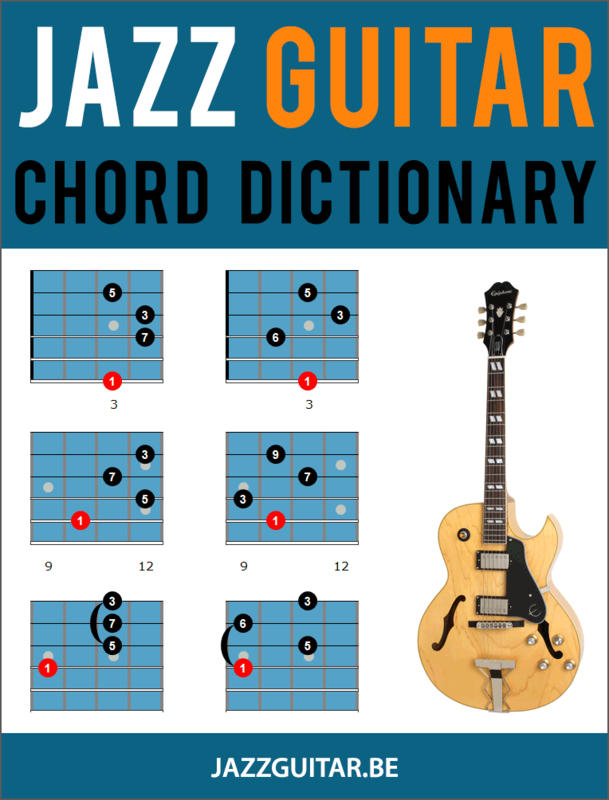 There are many ways to practice guitar scales, but this is a particularly good one because the chromatic notes give the scale an instant jazz sound. The example below is in the B Dorian mode, make sure you use the same principle on other scales and positions. We will now take a look at four different ways to add chromatic notes to the major scale. All of these riffs will be two beats (four eighth notes) long in order to get them under our fingers quickly and transpose them easily. The first bar of this example uses the dominant bebop scale, played over a major chord. The bebop scale is normally used over a dominant chord (G7 in this key), but it can also be used over any chord in the parent key. The second bar outlines a very common chromatic passage. This is where we start on the third (in this case, E) of the major scale and then play #1, 2 and back to 3. Think of it as starting on the third and playing back to the third using a chromatic approach to the 2nd note (D) of the scale. In the third bar, the 4th note (F) of the scale is connected to the 3rd note (E), by way of two chromatic approaches from below E.
The fourth bar has the same concept, only this time applied to the root (C) and the 7th (B). Once you have these under your fingers in the key of C, you are ready to move on to example 3. You can practice punching them into scale fingerings you already know, or treat them as separate entities and think of them as individual units that you can move around to different chords. The first bar uses the 1st and 2nd line from example 1. The second bar uses the 3rd and 4th line. The third bar uses the 1st and 2nd lines. The last bar uses the 3rd line. You might notice that the line sounds like an exercise, and it should. At this point, we are trying to get these shapes under our fingers and these sounds into our ears. Once you have them down it will be easier to develop more creative and musical lines. Now that you can apply these two beat ideas, you can add some basic harmonic substitutions to the chord progression. The chords that we will be adding will be a half step (one fret), above the chord that follows. In this example, we have added a Db7 that resolves to the Cmaj7 in the next bar (tritone substitution). For the purposes of this exercise, the line is written in eighth notes. Once you have this line down try changing the rhythm to gain more interest in the line. In this line, we are now adding an Ab7 chord that resolves to the G7 chord (tritone substitution as well). Even though we are stepping further “out” with this and the following lines, the fact that our two beat motives outline the harmony so well helps to keep the idea from falling apart. We are now at the limit of adding chromatic approach chords with the Bb7 resolving to the A7b9. Once you have these substitutions under your fingers, you can choose which ones you want to use and when you want to use them. Just because you know all of these cool harmonies does not mean that you have to saturate your lines with them. The biggest lesson to learn is that “out” lines only work when they are played after or in between “in” lines that give them their contrast. Since the first four two note ideas have been highly chromatic and mostly descending in nature we can now look at three ways to play ascending and more “inside” the scale/chords. The first pattern is what is commonly referred to as “1235“, where each chord is outlined using the 1st, 2nd, 3rd and 5th note of the scale or mode that corresponds to it. The second pattern is the arpeggio (1357) on each chord in the progression. The last pattern is the arpeggio with a chromatic approach tone below the root. Though these ideas have been written out over the chords in the progression, they can be used over any chord in the key we are playing in. For example: in this progression in the key of C, we can outline Cmaj7, Dm7, Em7, Fmaj7, G7, Am7 and Bm7b5 (all of the chords found in the key of C major). You will now apply these three ideas to the chord progression. In this example, you start out with a mixture of the new and old ideas. Notice how each bar starts off sounding inside on the first two beats and then is led into a more chromatic sound in the last half of the bar before resolving on the downbeat of the following bar. This helps create a tension and release element to the line and makes the major scale that we are basing our lines off of sound much more in the jazz idiom. In the next line, you will add the chromatic approach chord leading into the Cmaj7 chord in bar 3. This idea is similar to what we have already done but notice how the arpeggio in the first half of the 2nd bar sets up the substitution nicely. Here you add a chromatic approach chord (Ab7) to the G7 chord in bar 2. In this last example, you add the Bb7 resolving to the A7b9 in bar four. Here is a solo written out over the chord changes of Tune Up, a famous Miles Davis standard. Once you have these exercises under our fingers, try playing them in different keys and on different parts of the neck. Learning to play a line from memory is only the beginning of the process. Once we can manipulate a line by changing the rhythm, playing it in different octaves and different areas of the neck, we have truly ingrained the concept. 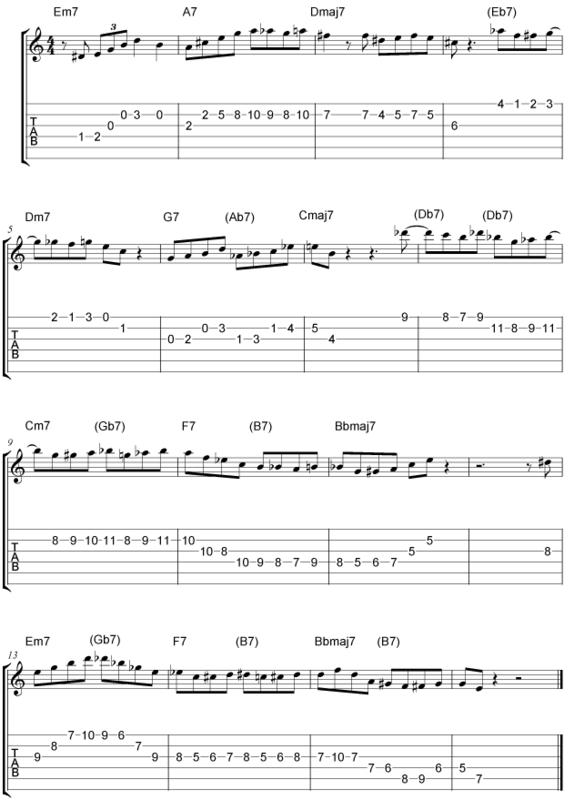 Good exercise; finger gymnastics, fret board memorization and a real jazzy sound…. thanks Dirk. A good warm up also. The lessons are simple and good. Great lesson on a very important and fun topic. Thanks!